SMART CUT™ Sintered (metal bond) series New Generation & Technology Dicing Blade are some of the thinnest, universal, and long lasting blades available today. You can't gent more life out of any other blade. Manufactured utilizing SMART CUT technology, Sintered (Metal Bonded) dicing blades will give you consistent results you can count on everyday. Sintered (Metal bonded) diamond blades diamonds sintered and multiple layers of diamonds impregnated inside the metal matrix. Diamonds are furnaces sintered in a matrix made of iron, cobalt, nickel, bronze, copper, tungsten, alloys of these powders or other metals in various combinations. 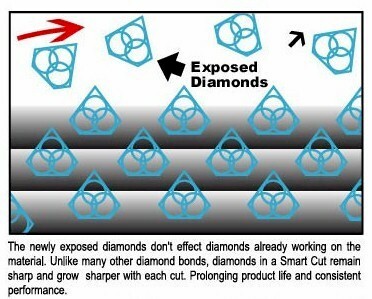 Metal Bonded Dicing Blades are “impregnated” with diamonds. The compacted materials are then hot pressed or sintered to full density. Heating rate, applied pressure, sintering temperature and holding time, are all controlled according to the matrix composition. This means that selected diamonds are mixed and sintered with specific metal alloys to achieve the best cutting performance possible on any large variety of material. The metal bond surrounding the diamonds must wear away to continuously keep re-exposing the diamonds for the diamond tool to continue cutting. 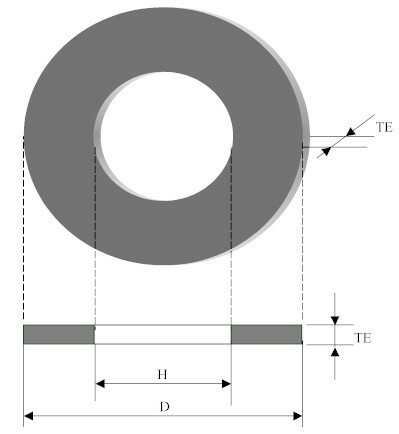 Sintered (metal bonded) dicing blades are recommended for cutting wide variety of materials from 45 to 75 on Rockwell Scale (5 to 9.5 on mohs scale of hardness). It is more wear resistant and holds diamond well in place, usually producing the highest yield/cutting ratio. 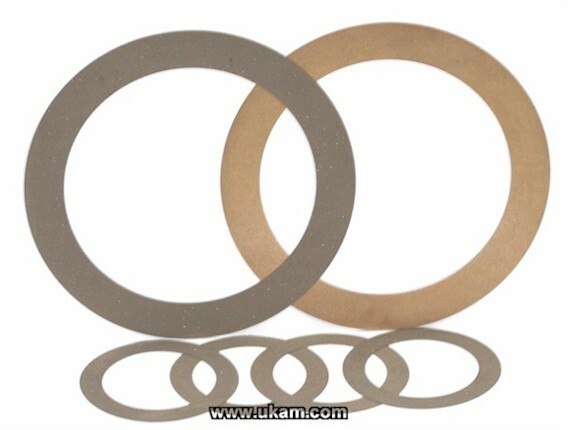 As a general rule of thumb, Metal Bond (sintered) diamond dicing blades longer than other diamond bond blades such as resin bond and electroplated (nickel bond) blades. They wear evenly, and are known for their long life & consistency. 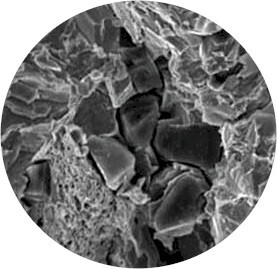 Metal bond matrix does not protrude diamonds very high and hence usually requires lower cutting speeds than electroplated (nickel bond) and resin bond blades. In many dicing applications sintered (metal bond) dicing blades are used in applications which are not super hard or super brittle and with minimum tendency to produce chips or cracks. Feed Rate: 1/4" to 1/2" per minute. Start with 2mm per minute and gradually increase. Start off slowly, increase gradually, check how blade is performing at various RPM's. Adjust as needed. Blades Over 4.5" OD: Maximum exposure 80/10 mil. Recommended Starting Speed 4,000 RPM. Feed Rate: .04" per minute. Gradually increase every three cuts, until RPM reaches five times the starting speed. © Copyright 2002-2010. UKAM Industrial Superhard Tools. No portion of this web page or its designs, images, and logos may be reproduced in any form without written permission from UKAM Industrial Superhard Tools.